Recently my brother and I went to the Franklin Institute to check out the Dead Sea Scrolls exhibit (btw this was very cool). On the way out I stopped by the gift shop to pick up some astronaut ice cream and while in the store noticed some quill pens lying around. Being the adventurous pen reviewer that I am, I picked it up for a review. 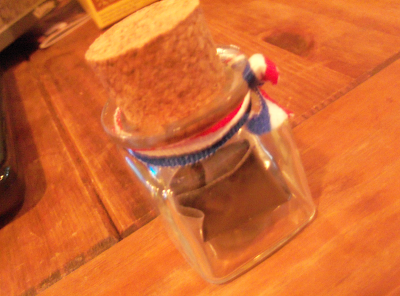 The quill and ink set came with one quill and a small glass bottle with a cork stopper and a small bag of dry ink. In order to make the ink you add a small amount of hot water to a small amount of ink. The less water you add the thicker the ink will be. A thicker ink makes a thicker line. The ink is a nice dark black when writing but quickly fades to a grey-black. The ink takes quite a while to dry, so be warned. 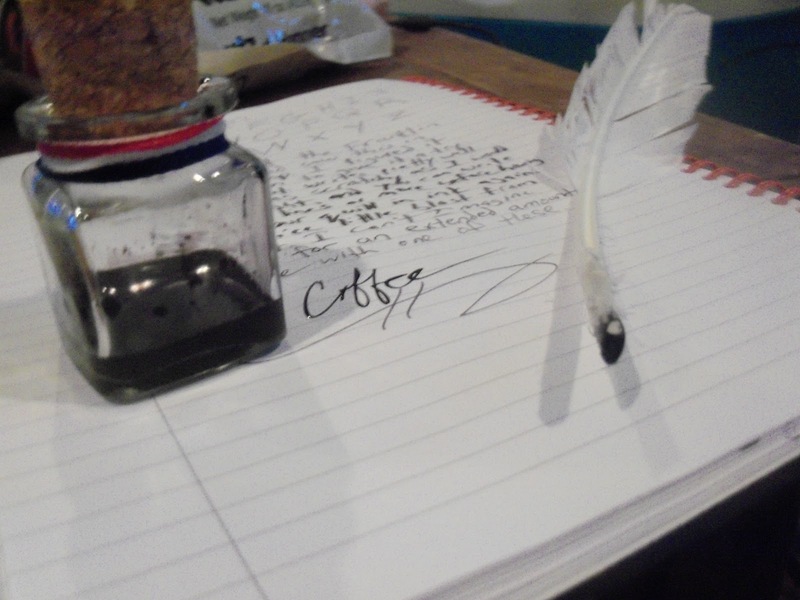 The quill itself needs no preparation before use, you just dip the tip in ink and begin writing. Surprisingly the quill isn't very scratchy at all. I was expecting a very scratchy writing experience and it wasn't. Now don't confuse me saying "It's not scratchy" with me saying "It's a smooth writing experience". 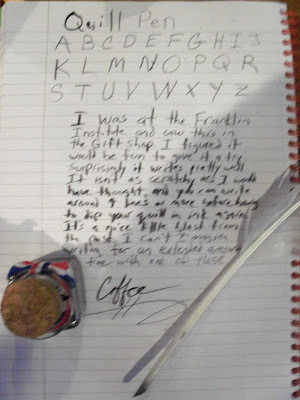 The pen has resistance on the page and cursive writing is a hassle, but the scratching I expected wasn't present. Directly after you apply ink to the tip is when the quill feels the smoothest, and it begins to drag a bit against the paper as the ink runs out. Also, this pen is extremely squeaky. If you need to write something in a discreet manner this isn't the pen for you. Then again if you are looking for discretion you probably aren't carrying a quill and bottle of ink. The quill is a precursor to the modern pen and it is interesting to be able to look into the past of writing utensils. I can't imagine people writing with these things as an everyday task. I definitely recommend trying one out if you get the chance they are a lot of fun. No ranking for this because it is so different. WHOA! This is sooo cool! This totally reminds me of old awesome manuscripts! 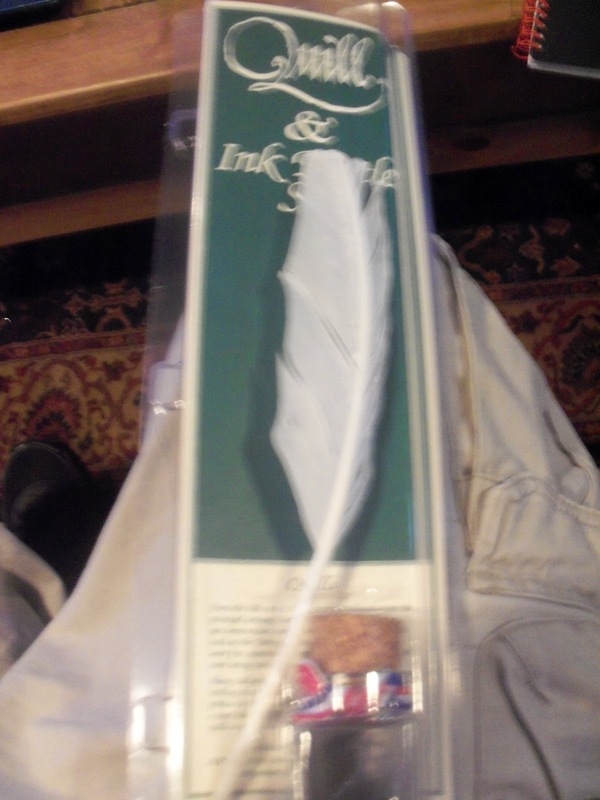 I've never seen a quill pen around here but I've been keeping my eye out. I did consider picking up a feather I found and just playing around with the tip but that seemed kinda weird. Nice review!